X rays are a form of electromagnetic radiation with wavelengths that range from about 10 −7 to about 10 −15 meter. No sharp boundary exists between X rays and ultraviolet radiation on the longer wavelength side of this range. Similarly, on the shorter wavelength side, X rays blend into that portion of the electromagnetic spectrum called gamma rays, which have even shorter wavelengths. X rays have wavelengths much shorter than visible light. (Wave lengths of visible light range from about 3.5 × 10 −9 meter to 7.5 × 10 −9 meter.) They also behave quite differently. They are invisible, are able to penetrate substantial thicknesses of matter, and can ionize matter (meaning that electrons that normally occur in an atom are stripped away from that atom). Since their discovery in 1895, X rays have become an extremely important tool in the physical and biological sciences and the fields of medicine and engineering. X rays were discovered in 1895 by German physicist William Roentgen (1845–1923) quite by accident. Roentgen was studying the conduction of electricity through gases at low pressure when he observed that a fluorescent screen a few meters from his experiment suddenly started to glow. Roentgen concluded that the glow was caused by certain unknown rays that were given off in his experiment. Because of its unknown character, he called this radiation X rays. Roentgen discovered that these rays were quite penetrating. They passed easily through paper, wood, and human flesh. He was actually able to insert his hand between the source and the screen and see on the screen the faint shadow of the bones in his hand. He concluded that more dense materials such as bone absorbed more X rays than less dense material such as human flesh. He soon found that photographic plates were sensitive to X rays and was able to make the first crude X-ray photographs. Computerized axial tomography (CAT scan): An X-ray technique in which a three-dimensional image of a body part is put together by computer using a series of X-ray pictures taken from different angles along a straight line. Hard X rays: X rays with high penetrating power. Nondestructive testing: A method of analysis that does not require the destruction of the material being tested. Soft X rays: X rays with low penetrating power. Synchrotron radiation: Electromagnetic radiation from certain kinds of particle accelerators that can range from the visible region to the X-ray region. X-ray tube: A tube from which air has been removed that is used for the production of X rays. The method by which X rays were produced in Roentgen's first experiments is basically the one still used today. 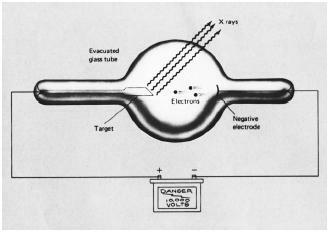 As shown in the accompanying X-ray tube drawing, an X-ray tube consists of a glass tube from which air has been removed. The tube contains two electrodes, a negatively charged electrode called the cathode and a positively charged target called the anode. The two electrodes are attached to a source of direct (DC) current. When the current is turned on, electrons are ejected from the cathode. They travel through the glass tube and strike a target. The energy released when the electrons hit the target is emitted in the form of X rays. The wavelength of the X rays produced is determined by the metal used for the target and the energy of the electrons released from the cathode. X rays with higher frequencies and, therefore, higher penetrating power are known as hard X rays. Those with lower frequencies and lower penetrating power are known as soft X rays. Medical. The earliest uses of X rays were based on the discoveries made by Roentgen, namely their ability to distinguish bone and teeth from flesh in X-ray photographs. When an X-ray beam is focused on a person's hand or jaw, for example, the beam passes through flesh rather easily but is absorbed by bones or teeth. The picture produced in this case consists of light areas that represent bone and teeth and dark areas that represent flesh. Some applications of this principle in medicine are the diagnosis of broken bones and torn ligaments, the detection of breast cancer in women, or the discovery of cavities and impacted wisdom teeth. X rays can be produced with energies sufficient to ionize the atoms that make up human tissue. Thus, X rays can be used to kill cells. This is just what is done in some types of cancer therapy. X-radiation is directed against cancer cells in the hope of destroying them while doing minimal damage to nearby normal cells. Unfortunately, too much exposure of normal cells to X rays can cause the development of cancer. For this reason, great care is taken by physicians and dentists when taking X rays of any type to be sure that the exposure to the rest of the patient's body is kept at an absolute minimum. on one another. In contrast, in making a CAT scan, a narrow beam of X rays is sent through the region of interest from many different angles. A computer is then used to reconstruct the cross-sectional picture of that region. Nondestructive testing. The term nondestructive testing refers to methods that can be used to study the structure of a material without destroying the material itself. For example, one could find out what elements are present in a piece of metal alloy by dissolving the alloy in acid and conducting chemical tests. But this process of testing obviously destroys the alloy being tested. X rays can be used to study the structure of a material without actually destroying it. One approach is based on the usual method of producing X rays. A sample of unknown material is used as the target in an X-ray machine and bombarded with high energy electrons. The X-ray pattern produced by the sample can be compared with the X-ray patterns for all known elements. Based on this comparison, the elements present in the unknown sample can be identified. A typical application of this technique is the analysis of hair or blood samples or some other material being used as evidence in a criminal investigation. X rays are used for nondestructive testing in business and industry in many other ways. For example, X-ray pictures of whole engines or engine parts can be taken to look for defects without having to take an engine apart. Similarly, sections of oil and natural gas pipelines can be examined for cracks or defective welds. Airlines also use X-ray detectors to check the baggage of passengers for guns or other illegal objects. Synchrotron radiation. In recent years an interesting new source of X rays has been developed called synchrotron radiation. Synchrotron radiation is often produced by particle accelerators (atom-smashers). A particle accelerator is a machine used to accelerate charged particles, such as electrons and protons, to very high speeds. As these particles travel in a circle around a particle accelerator, they may give off energy in the form of X rays. These X rays are what make up synchrotron radiation. One of the more important commercial applications of synchrotron radiation is in the field of X-ray lithography. X-ray lithography is a technique used in the electronics industry for the manufacture of high density integrated circuits. (A circuit is a complete path of electric current, including the source of electric energy.) The size of the circuit elements is limited by the wavelength of the light used in them. The shorter the wavelength the smaller the circuit elements. If X rays are used instead of light, the circuits can be made much smaller, thereby permitting the manufacture of smaller electronic devices such as computers. This website is for people interested in the technology and history of the x-ray machine. If you want to know about your health go talk to a doctor. You have told that energy is released when accelerated electrons hit the target. But please tell me how energy is released? What happens in the target? It is wonderful article about x-rays.Please tell me how x-rys are emitted from laser induced plasma? i am working as SEM operator in NITT . will the Xrays come from the instrument? If it comes it will affect me? WHAT ARE THE PHYSICS INVOLVED IN A X-RAY MEDICINE? am a physics teacher,am asking for a scientist friend.